• Panner - 250 grams. • Almonds - 15 number. • Whole garam masala dry - 2 number. • Black cumin - 1 tea spoon. • Coriader powder - 1 tablespoon. • Koya - 1 tablespoon. 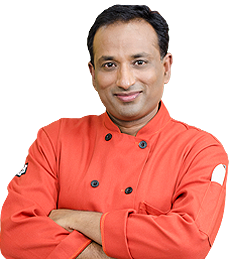 Take a pan add oil, whole garam masala, cumin seeds, onion salt mix well then add ginger-garlic paste, pepper powder, coriander powder, make almond past add the past and add water cook for 30minutes. Cover with the lid then add paneer, garam masala, khoya mix well and cook for 5minutes if required add cream and bring it to boil. Shahi Paneer is a very popular and rich vegetarian recipe. Shahi paneer is immensely... Read More..
Shahi paneer is immensely popular in northern India and originated from the Mughlai cuisine. This north Indian dish is liked by most of the people as it is a rich dish filled with spices, almond paste, cottage cheese and cream that makes it thick creamy and spicy to taste. This dish is a popular main course vegetarian dish accompanied with roti, chapatti, naan or any flavored aromatic rice like the shahi jeera pulao etc. Paneer is the Indian word for cottage cheese, and Shahi is the Indo-Persian term for royal (in reference to the Mughal court). 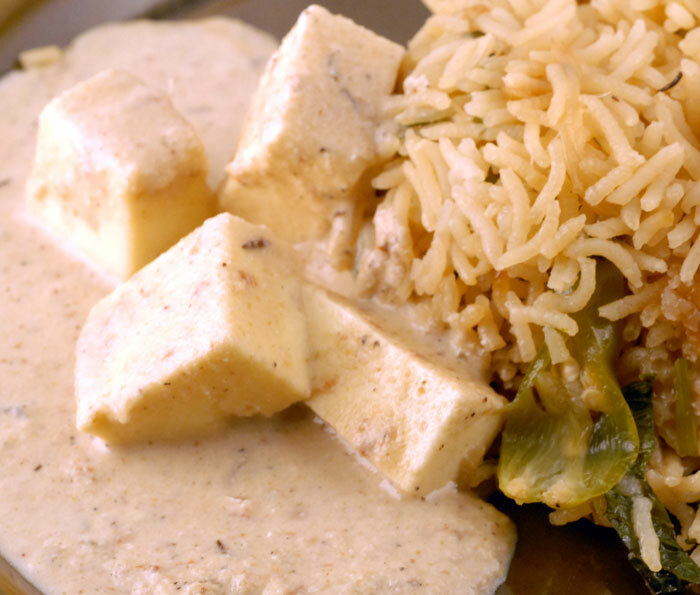 Paneer as such is a versatile ingredient that can be added in any special aromatic gravy. Few of the popular delicious dishes made of paneer are the paneer butter masala, mattar paneer, paneer tikka masala and many more.Adding cream or almond paste enhances the taste and indeed is one of those easy ones which can be prepared in no time. Paneer is one of the few types of cheese indigenous to the Indian subcontinent, and is widely used in Indian cuisine and even some Middle Eastern and South East Asian cuisine. Unlike most cheeses in the world, the making of paneer does not involve rennet (which may be derived from animal, plant, fungal, and microbial sources) as the coagulation agent. Paneer is completely lacto-vegetarian and is a source of protein for Vegetarians. Firm tofu has a similar texture and consistency so it can be used in place of paneer as a non-dairy substitute. Paneer is an adorable ingredient by many especially the kids and a delicacy in most of the Indian cuisine. It is widely used in many of the North Indian and Punjabi dishes and a gentle and soft ingredient made of milk. Homemade paneer or any other paneer is excellent when it has a nice texture, shape and flavor. Home made paneer has a refreshing and fresh tang that gives a nice amazing taste to the dish when cooked with gravy or spices. Paneer is readily available in the market but finest when prepared fresh at home. Shahi Paneer is a festive main dish that is creamy and rich in flavor. It is usually a dish prepared during special occasions. Shahi paneer can be served with any Indian bread, such as naan or with rice. It is a very popular vegetarian recipe and many a times referred to as the Royal dish. Though traditionally this dish is a rich recipe, its amazing color, flavor and taste definitely make it worth trying. The difference is in the prominence of adding the right spices. Shahi paneer – where shahi denotes royalty, the dish truly fits for ardent food lover who love to eat food like a King. There’s everything in the dish like the richness of almond paste, cream, cottage cheese that makes the dish royale and eye catchy. To prepare the Shahi paneer, take a pan add oil, whole garam masala, shahi jeera, finely chopped onions, salt and mix well. Do not brown the onions as this is going to be a nice white creamy sauce. Add ginger garlic paste, white pepper powder, coriander powder, almond (badam) paste and cook it covering the lid. Add water to get the right consistency.Cook for about 30 mins. When comes to boil add paneer cubes, garam masala powder, koya and mix well and cook for about another 5 – 10 mins. To give a nice richness to the dish you can add cream and bring it to boil. This dish is truly heavenly, creamy, soft, sweet, spicy and nutty flavor. Serve it hot. The recipe is hassle free, gravy is quick to make and also lip smacking. It can be made a day before, and paneer can be added before serving. Cream enhances the taste. Paneer; Indian cheese prepared in the most simple method has many health benefits and it is good to know all about them. Indian cheese is a treasure of nutrition. It is easy to digest and can be used in a number of preparations and is used in most Indian homes. It can be used in sweets, savories, and in gravies of dishes too. Indian cheese is a rich source of calcium. This helps in building strong teeth and bones. Paneer has the health benefit of preventing osteoporosis, which is a curse of old age. Women who have attained menopause and men above the age of 65 should make it a rule to include it in their diet to get 25% of calcium through food. Paneer taken in moderation could help reduce weight. It is good to note that many people who wish to lose weight take to including Indian cheese or paneer in their daily diet. Paneer also gives the health benefits of reducing the development of insulin resistance syndrome. Hence it is all about tackling the problem of insulin dependent diabetes. I would watch a full episode of him eating. Great stuff. You are really turning me on to The Indian cuisine. YUM! isnt Shahi Paneer orange in colour? This sounds very sweet. YUM. I shall give it a try.